1. 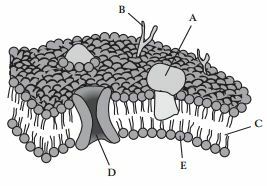 Question below refers to the following cell membrane diagram. This molecular structure is composed of lipid chains. 2. 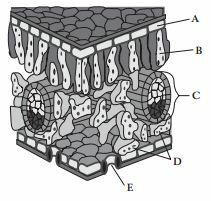 Question below refer to the following cell membrane diagram. This structure is involved in facilitated diffusion. 3. Question below refer to the following cell membrane diagram. This molecular structure is hydrophilic. 4. This nucleic acid carries genetic information to the site of translation. 5. This nucleic acid contains an anticodon. 6. This nucleic acid is associated with histone proteins. 7. Question below refers to the following leaf diagram. Photosynthesis primarily occurs in this tissue. 8. Question below refers to the following leaf diagram. These cells regulate gas exchange in the leaf. 9. Question below refers to the following leaf diagram. 10. This lymphocyte matures in the thymus gland. 11. This produces antibodies specific to an infecting agent. 12. This produces antigens in the body. 13. This cell type is involved in nonspecific immunity. 14. Question below refers to the following diagram. 15. Question below refers to the following diagram. 16. Question below refers to the following diagram. Crossing over occurs between this pair. 17. This can result in stabilizing selection in a population. 18. This is a characteristic of a population in Hardy-Weinberg equilibrium. 19. 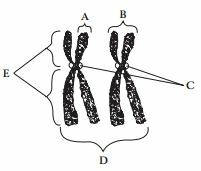 This is required for speciation to occur. 20. Which muscle type lines the interior walls of hollow organs?